Many of your students will have very little knowledge of pre-Columbian art aside from its representation in popular movies such as The Emperor’s New Groove or Apocalypto. Rather than see this as an impediment, you can use it as a learning opportunity. Show some stills (or even the trailers) from these movies that feature pyramids, stelae, or other examples of pre-Columbian art and architecture. After showing these stills or videos, ask the students what adjectives come to mind when they look at these images. You can also ask them what comes to mind when they think of the Maya, Aztecs, and Incas in general. Some of the terms you hear may include “primitive,” “savage,” “cannibalistic,” “mysterious,” and “militaristic.” Ask the students how movies and popular culture help to perpetuate stereotypes about indigenous peoples. If you want to also make a connection to native North American cultures, you can show images of the Washington Redskins, the Cleveland Indians, and a whole range of problematic memorabilia. Once you have established with your students the rampant stereotypes that shape our pre-conceived notions of indigenous art and culture, you can begin to dismantle them with each image that you show in lecture. A few notes on vocabulary: pre-Columbian = before Columbus. Pre-Hispanic is also a commonly used term. The various peoples that inhabited pre-Columbian Latin America are referred to as “cultural groups,” “civilizations,” and “empires,” when appropriate. The term “tribe” is not appropriate in this context. When referring to the native peoples of Latin America, the accepted terminology includes “Amerindian” and “indigenous.” “Native American” more commonly refers to groups in North America. “Mesoamerica”—literally, “middle America”—refers to Mexico and Central America, while “the Andes” refers to the Andean mountain chain of South America. Regarding terminology in the Americas, many scholars choose to write ‘precolumbian’ in order to de-emphasize Columbus’s role in this time period. This language intends to correct and mitigate the prevailing Eurocentric worldview that has been historically imposed upon the Americas and has often obscured recognition of indigenous influence, achievement, and rights. Either term is acceptable nomenclature, and invoking this debate may provide a succinct in-road to discussing issues of identity that arise frequently in American art. The lectures on this website use ‘pre-Columbian’ exclusively for purposes of clarity. A few themes to stress throughout the lecture include art as a form of communication, the intersections between art and ritual, and the continuity of cultures. This will help students to understand pre-Columbian art not only for its aesthetic qualities, but also for the various roles it played in Mesoamerican, Caribbean, and Andean societies. Also, by stressing the iconographical and stylistic interconnectedness of various pre-Columbian objects, students will have a better sense of how different cultures interacted with and borrowed from others. Aerial view of Teotihuacan, Mexico, 0–700CE. Smarthistory also has a few informative pieces on individual Pre-Columbian objects such as “Classic Maya Portrait Stelae” by Catherine Burdick. John Pohl provides an informative overview at Annenberg Learner of Lintel 25 at the classic Maya site of Yaxchilan. Stacy Goodman’s discussion of a Moche Portrait Head also provides good background on ceramics of the north coast of Peru. The Colossal Head belongs to the Olmec culture, one of the earliest pre-Columbian civilizations in Mesoamerica. Originally referred to as the “Mother Culture” of Mexico by the famed Mexican intellectual Miguel Covarrubias, scholars have since revised this theory in light of archaeological discoveries of contemporaneous cultures located in the Valley of Oaxaca. Nevertheless, the Olmec produced tremendous architectural complexes and monumental sculptures that have captivated the attention of archaeologists and enthusiasts for the past century. Perhaps most impressive in the corpus of Olmec visual culture are the colossal heads. They are made out of basalt quarried from the nearby Tuxtla Mountains, some of them up to nine feet high and weighing twenty-eight tons. The heads are incredibly naturalistic, and possess an impressive individualism. The expressions vary from downturned, frowning mouths to more placid expressions. Some even feature crossed eyes, which some art historians interpret as signifying a trance-like state. This suggests that the individuals represented may have utilized hallucinogens as a means of transporting themselves to a supernatural realm, a practice shared by a number of pre-Columbian civilizations throughout the Americas. The heads likely depict rulers and were frequently re-carved or even defaced after their death. The act of ritually defacing the stone may have served as a means to physically “mark” the former ruler’s death. This practice also enabled Olmec artists to recycle the immensely heavy basalt boulders, whose transportation from the Tuxtla mountains required enormous manpower given the absence of the wheel in the pre-Columbian Americas. 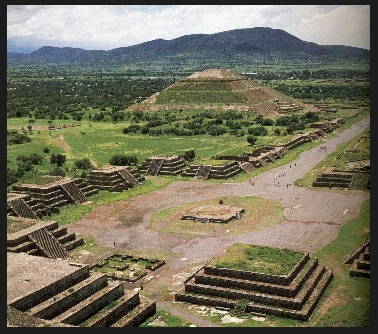 The Teotihuacan civilization, located about thirty miles northeast of modern-day Mexico City, was the first urbanized center in all of the Americas. With a population of about 125,000 inhabitants at the height of its rule in 600 CE, the city of Teotihuacan was the largest city in the Americas and the sixth-largest in the world. It contained over 2200 apartment compounds arranged along a grid. The most prominent feature of Teotihuacan’s built environment is the Pyramid of the Sun, which was constructed early in the site’s history around c. 150–225 CE. The colossal pyramid was built atop a sacred cave and was probably intended to honor one of Teotihuacan’s rulers. The pyramid was constructed using the talud tablero technique, consisting of a sloped talud (talus) and a vertical tablero to create its telltale stepped appearance. This architectural signature was disseminated throughout Mesoamerica and can also be found among Maya pyramids throughout southern Mexico and Guatemala. Perhaps one of the most impressive works of art produced by the Maya culture is Lintel 24: Shield Jaguar and Lady Xok from the site of Yaxchilan. This stone relief carving depicts Shield Jaguar, one of Yaxchilan’s kings who ruled from 681–742 CE (his Maya name was Itzamnaaj B’alam II), standing in profile with a torch in hand while his wife, Lady Xok, kneels before him. She is engaged in a common form of elite bloodletting: passing an obsidian-laced rope through her tongue. The droplets of blood are collected in a small container filled with paper. In a subsequent lintel, a stylized serpent-like cloud emanates from the container, representing the burning paper. The paper served as a conduit for converting sacrificial blood into smoke, a substance that, as the lintel demonstrates, held transformative, otherworldly properties. Shield Jaguar is positioned directly in the maw of this zoomorphized serpent-smoke plume, pointing a spear directly at a frightened looking Lady Xok. Glyphs lining the edges of the perimeter of the relief carving identify the subject matter and date of each lintel. The images were originally positioned above the southeast doorway of the site’s main temples. More information can be found at the British Museum, which has Lintels 24 and 25. Archaeologists have interpreted this lintel as a glorification of Lady Xok’s political capabilities given her decision to have herself represented as a key facilitator to Shield Jaguar’s transformation. Indeed, these lintels serve as the first documented instance of female artistic patronage in the ancient Americas. The Toltec culture, centered at the modern day city of Tula, Mexico, was greatly admired by the Aztec civilization, who frequently emulated its artistic and architectural style. It also marked the site where the famous Aztec god, Quetzalcoatl (the Feathered Serpent), was thought to reside. The site’s Colossal Atlantids are anthropomorphized architectural supports that originally held up the roof of a temple. The stiff, dignified figures wear feather headdresses and butterfly pectorals. Their status as warriors is further demonstrated by the atlatls (spearthrowers) that they hold in their hands. The blocky, stiff Toltec sculptural style eventually gave way to a more fluid, naturalistic stone carving technique developed by the Aztecs. Across the Gulf of Mexico in the Caribbean, the Taíno civilization spread its sphere of influence across the islands of Cuba, Puerto Rico, and the Dominican Republic. The Taíno region consisted of a series of chiefdoms led by a cacique. The Taíno are perhaps best known for their famous encounter with Christopher Columbus in 1492. Lawrence Waldron’s website Ancient Antilles is a must-see for background information on the art, culture, and history of the pre-Columbian Caribbean. One of the most important genres of material culture among the Taíno people are Zemis, usually made from stone or wood. Zemis represented gods and ancestors, and were often associated with rituals involving inhalation of cohoba and other hallucinogenic substances. As we saw with the Olmec and other pre-Columbian civilizations, hallucinogens were utilized as a means to enter into the supernatural world. The use of these substances was highly regulated and ritualized; only religious specialists would have access to hallucinogens. While the Taíno civilization was almost completely wiped out by the sixteenth century due to warfare and disease brought on by the Spanish conquest, Taíno culture retains a lingering presence in the Spanish language. For instance, words such as barbacoa (barbeque), canoa (canoe), and tabaco (tobacco) are all indigenous words that were absorbed into the Spanish vocabulary. Moreover, scientists have recently discovered that upwards of 60% of modern Puerto Ricans have indigenous mitochondrial DNA. The Chavín were among the earliest civilizations in the central Andes of Peru. The Raimondi Stela, originally located at the site of Chavín de Huantar, is currently housed at the Museo Nacional de Arqueología, Antropología e Historia in Lima, Peru. This seven-foot-tall granite stela features the Chavín “staff god,” an agricultural deity. He wears a towering headdress consisting of swirled protrusions and serpents. The staff god looks up, as if to establish a connection with the upperworld. The stela’s most remarkable feature is that the figure can still be “read” when the image is flipped. What originates as an upright earth deity—when turned upside down—is transformed to a hovering celestial figure with an elongated tongue that unfolds like a Jacob’s Ladder. The Paracas culture on the southern coast of Peru produced some of the most intricate embroidered cloths in the pre-Columbian Americas. The notoriously dry, desert environment of the Paracas peninsula helped to preserve 429 mummy bundles, making it the richest burial ground in the world. The Embroidered Funerary Mantle consists of a black ground cloth almost entirely covered with embroidered designs of dancing or flying figures set against a red background. This mantle would have originally been wrapped around the body of the deceased and buried in an underground funerary chamber. Scholars have debated whether the figures represent shamans in a trance state or ritually sacrificed individuals with disarticulated heads. The remarkable preservation of the Paracas textiles, while undoubtedly facilitated by the excessively dry conditions of Peru’s southern desert coast, also speaks to the great care taken in the crafting of high-quality, precious cloth. The fibers used in the creation of the Paracas mantles derive from both locally-sourced cotton and camelid (llama, alpaca, and vicuña) fibers imported from the highlands to the east. The Paracas textiles also clue us in to the importance of funerary rites and ancestor worship in the Andes, which extends well into the present day among many Andean indigenous communities. The great care afforded to the preparation of the deceased body for the afterlife reflected the belief that death merely signified one step in a much longer journey from the world of the living to the world of the supernaturals. The nearby site of Nazca boasts some of the most well known examples of pre-Columbian Andean art: the Nazca Lines. Long considered to be the work of aliens, archaeologists have put to rest such baseless theories (although they continue to persist in popular culture and the work of famed pseudo-archaeologist Erich von Däniken). The lines consist of about a dozen figural representations, including a hummingbird, monkey, snake, and dolphin. The vast majority of the lines, however, are straight lines that run parallel, converge, and intersect across the Nazca pampas (plains). These lines are thought to trace the direction of underground water sources, and the figural geoglyphs became important sites of pilgrimage. About 500 miles north of the Paracas peninsula is the heartland of the Moche culture, which settled along a series of river valleys between the modern-day coastal cities of Trujillo and Piura, Peru. The Moche were the first state-level society in the Andes, headed by regional lords. Large adobe huacas (pyramids) dot the desert landscape, many of which were brightly painted in antiquity. One of the hallmarks of every Moche site are the hundreds of mold-made ceramic pots deposited in the graves of elite individuals. The Moche Portrait Pot depicts a high-status male with a bird headdress. The round handle on the back of his head doubles as a spout, indicating that the pot would have been used for storing liquids to provide sustenance to the deceased in the afterlife. The naturalism of Moche portrait pot vessels is unsurpassed in the pre-Columbian Americas; the Moche exhibited a keen interest in emphasizing the specific likeness of elite (usually male) individuals. The slightly pursed lips, high cheekbones, and furrowed brow all serve to give the portrait a lifelike quality. The pots tend to be painted in neutral earth tones using a slip technique. The Tiwanaku civilization of the southern Andes straddles the modern-day border of Peru and Bolivia, located along the shores of Lake Titicaca. This area is known as the altiplano (plateau) region where people made their living herding llamas and fishing. Like the Toltec relationship to the Aztecs, the Tiwanaku peoples were celebrated and emulated by the Inca, who traced their imperial origin story to the islands of the Sun and Moon on Lake Titicaca. The site of Tiwanaku contains a number of architectural complexes, including the Akapana, Pumapunku, and the Sunken Courtyard. Perhaps the most emblematic feature of the site is the Gateway of the Sun. This monolithic doorway may have been one of many doorways marking the entrance of one of the buildings. It features low-relief carvings of sixteen winged figures and thirty-two human heads set within squares across the lintel. The doorway contains deeply carved niches on the back, suggesting that they may have originally contained statues or offerings. After the fall of Tiwanaku around 1000 CE, several smaller regional cultures took hold of the region. It wouldn’t be for another 400 years that the Inca empire would exert control over nearly the entire western half of South America, only to be conquered less than a century later by Francisco Pizarro and his army of Spanish conquistadors. How does this object communicate beliefs or values associated with its culture? How did that culture use art as a way of conveying message without reliance on the written word? What kind of religious or political beliefs do these objects convey? How? What kinds of individuals are being depicted, and what activities are they engaged in? Describe the style employed by the artist. Is it naturalistic? Abstract? Geometric? Stylized? What kind of visual impact does this have on the viewer? Consider the size of the object and its original location. What kind of impact might these factors have had on original viewers? What kind of experience would the object have facilitated? Who might have had access to these images? Ananda Cohen Suarez (author) received her PhD from the CUNY Graduate Center in 2012 and is currently an Assistant Professor of Art History at Cornell University. She specializes in Pre-Columbian and Colonial Latin American art history, with a special emphasis on the colonial Andes. She and her colleague Renee McGarry run the blog Latin America Visualized (latinamericavisualized.wordpress.com).